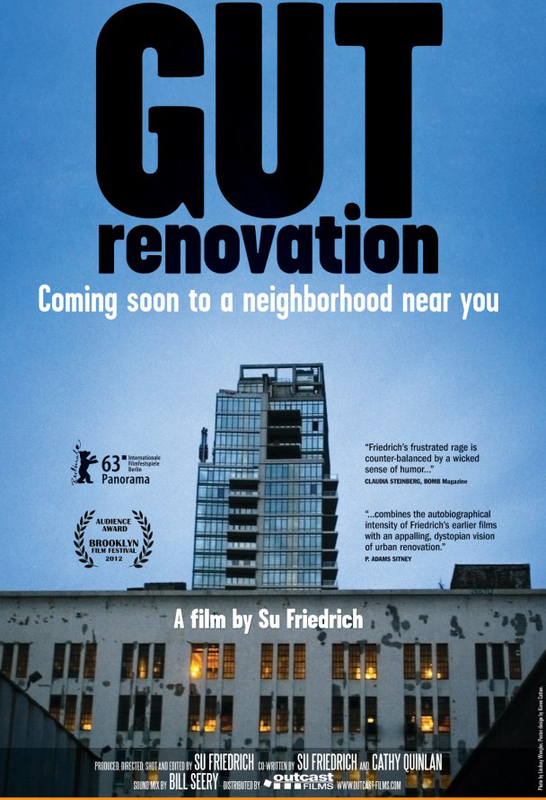 Anger fuels GUT RENOVATION, the documentary by filmmaker Su Friedrich about "development" and "gentrification" (D&G) in Williamsburg, and how a neighborhood full of manufacturing and artists' residences and studios is suddenly turned into a playground for the wealthy. 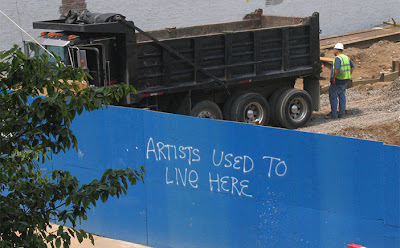 In my experience, living for a long while in Manhattan's Upper West Side, D&G usually takes time to make itself felt; it can often be two to three decades before a neighborhood changes drastically -- particularly if the gentrification occurs slowly, with the development more or less piecemeal. That was not the case in Williamsburg, where a sleazy and unnecessary (except to make developers even more wealthy) zoning change took place that opened the door for an almost immediate and quite shocking level of demolition-followed-by-building within a very small amount of space and time. One of the saddest, yet darkly funny, continuing jokes of this movie is the map (shown below) the filmmaker has constructed, showing us how -- property by property, block by block -- warehouses, manufacturing facilities and residences fall to this "development." So much in such a small area! There's a lot of humor in the film, too, bleak and black as it is, which saves the documentary from becoming too much of a diatribe. Though, as a resident of the area who soon loses her home, Ms Friedrich can hardly be blamed for her immense anger. 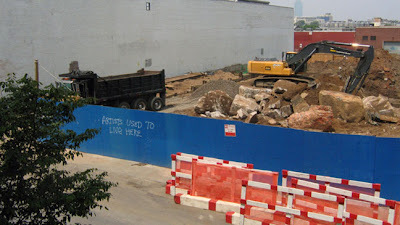 The filmmaker gives us some history of the area, especially of the Ironworks that figures prominently into things, and then offers up a commercial from the real estate industry about the upcoming development that promises buyers "Your own authentic style." Huh? The "style" we're shown in some of these new apartments (of which the filmmaker pretends to be a possible buyer, in order to gain access) looks pretty chintzy. 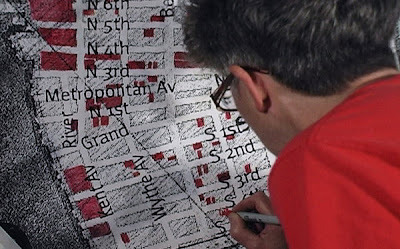 The movie, by the way, is almost entirely personal and anecdotal, so don't expect, as I did going into it, something on the order of that great doc Battle for Brooklyn. Friedrich's film is much smaller potatoes but it is deeply felt and very depressing, despite the almost constant humor, verbal and visual. (Ah, the dogs of the wealthy!) The sense of powerlessness that results from the form of unethical "eminent domain" shown here, uprooting a neighborhood and displacing its tenants from their homes and jobs, is overwhelming and awful. Honest to a fault, at one point, Friedrich tells us that a friend of hers suggested that she simply title her movie "I Hate Rich People." And sometimes she does come across this way. 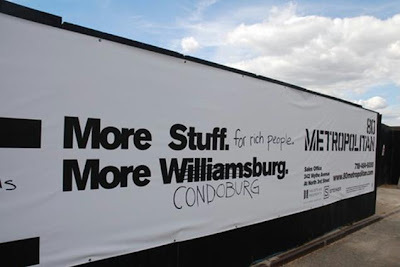 More energy might have been devoted to exploring the how and why of that rezoning and the official report that was initially demanded but then ignored because it showed that industry was actually thriving in Williamsburg. 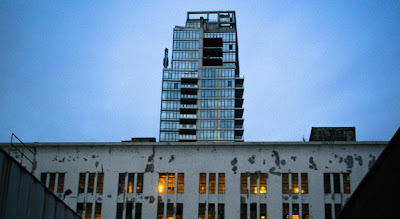 It was, after all, the usual cabal of real estate/developer/politician cronies who enabled and were responsible for this entire fiasco. The rich who moved in simply took advantage of what they were offered. The film's funniest and most sustained bit of humor derives from a huge boulder (above) that neither man nor machine can seem to move or break apart. I'd imagine that the filmmaker began to identify with that boulder. Change is inevitable, however, and eventually the boulder is broken. 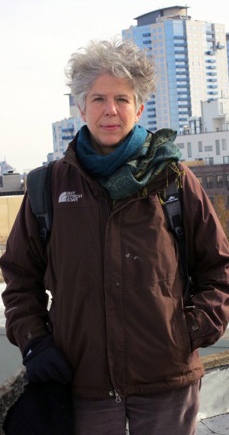 And Ms Friedrich and her companion must move. 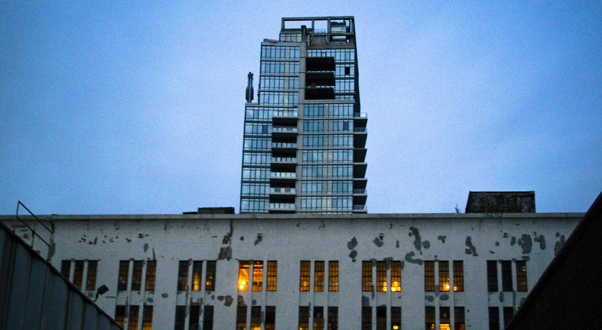 If you live in, or anywhere near, a neighborhood ripe for gentrification, I think you'll want to see this movie. 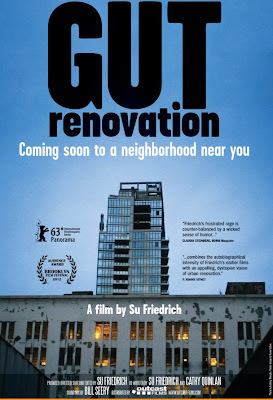 After its initial run last month at Film Forum, Gut Renovation -- from Outcast Films and running 81 minutes -- is back, starting tomorrow in Brooklyn, at the reRun theater. Click here for further information and/or tickets.